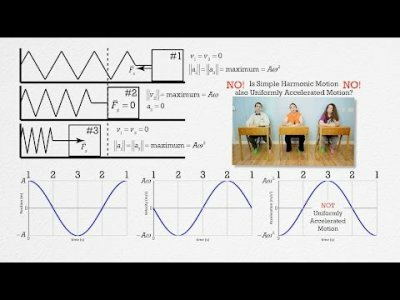 Calculus based review of Simple Harmonic Motion (SHM). SHM is defined. A horizontal mass-spring system is analyzed and proven to be in SHM and it’s period is derived. The difference between frequency and angular frequency is shown. The equations and graphs of position, velocity, and acceleration as a function of time are analyzed. the phase constant Phi is explained. And Conservation of Mechanical Energy in SHM is discussed. For the calculus based AP Physics C mechanics exam. 4:39 Are frequency and angular frequency the same thing?